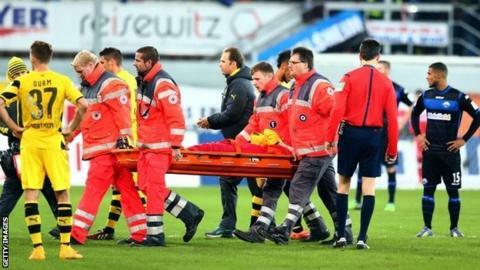 Borussia Dortmund midfielder Marco Reus's injury problems continued as he was stretchered off in a draw at Paderborn. Reus, who missed the World Cup with an ankle injury and was out for another spell earlier this term, was a pre-match fitness doubt. But he started the game and scored to make it 2-0 at half-time after Pierre-Emerick Aubameyang's opener. However Paderborn scored either side of Reus's injury to rescue a point. Last season's runners-up Dortmund are a point above the relegation play-off spot, although all four teams below them are yet to play this weekend. Match ends, SC Paderborn 07 2, Borussia Dortmund 2. Second Half ends, SC Paderborn 07 2, Borussia Dortmund 2. Foul by Pierre-Emerick Aubameyang (Borussia Dortmund). Lukas Rupp (SC Paderborn 07) wins a free kick in the defensive half. Foul by Kevin Großkreutz (Borussia Dortmund). Elias Kachunga (SC Paderborn 07) wins a free kick in the defensive half. Attempt missed. Marvin Bakalorz (SC Paderborn 07) right footed shot from outside the box misses to the left. Assisted by Elias Kachunga. Christian Strohdiek (SC Paderborn 07) wins a free kick in the defensive half. Substitution, Borussia Dortmund. Adrián Ramos replaces Henrikh Mkhitaryan. Mahir Saglik (SC Paderborn 07) is shown the yellow card for a bad foul. Sebastian Kehl (Borussia Dortmund) wins a free kick in the defensive half. Foul by Mahir Saglik (SC Paderborn 07). Pierre-Emerick Aubameyang (Borussia Dortmund) is shown the yellow card for a bad foul. Lukas Kruse (SC Paderborn 07) wins a free kick in the defensive half. Foul by Milos Jojic (Borussia Dortmund). Mario Vrancic (SC Paderborn 07) wins a free kick in the defensive half. Goal! SC Paderborn 07 2, Borussia Dortmund 2. Mahir Saglik (SC Paderborn 07) header from the centre of the box to the bottom left corner. Assisted by Süleyman Koc with a cross following a corner. Corner, SC Paderborn 07. Conceded by Sebastian Kehl. Substitution, SC Paderborn 07. Mahir Saglik replaces Florian Hartherz. Offside, Borussia Dortmund. Henrikh Mkhitaryan tries a through ball, but Kevin Großkreutz is caught offside. Erik Durm (Borussia Dortmund) wins a free kick in the attacking half. Foul by Michael Heinloth (SC Paderborn 07). Florian Hartherz (SC Paderborn 07) is shown the yellow card for a bad foul. Henrikh Mkhitaryan (Borussia Dortmund) wins a free kick in the defensive half. Foul by Florian Hartherz (SC Paderborn 07). Foul by Sebastian Kehl (Borussia Dortmund). Corner, Borussia Dortmund. Conceded by Rafa. Attempt saved. Marvin Bakalorz (SC Paderborn 07) right footed shot from outside the box is saved in the top centre of the goal. Attempt missed. Kevin Großkreutz (Borussia Dortmund) left footed shot from the centre of the box is close, but misses to the right. Assisted by Pierre-Emerick Aubameyang. Pierre-Emerick Aubameyang (Borussia Dortmund) wins a free kick on the left wing. Foul by Lukas Rupp (SC Paderborn 07). Neven Subotic (Borussia Dortmund) wins a free kick in the defensive half. Foul by Elias Kachunga (SC Paderborn 07). Attempt missed. Sebastian Kehl (Borussia Dortmund) left footed shot from outside the box misses to the left.